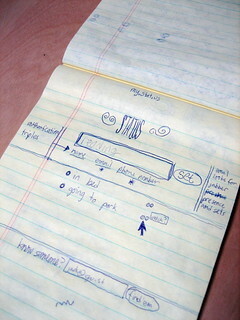 One night in July of that year I had an idea to make a more "live" LiveJournal. Real-time, up-to-date, from the road. Akin to updating your AIM status from wherever you are, and sharing it. For the next 5 years, I thought about this concept and tried to silently introduce it into my various projects. It slipped into my dispatch work. It slipped into my networks of medical devices. It slipped into an idea for a frictionless service market. It was everywhere I looked: a wonderful abstraction which was easy to implement and understand. The 6th year; the idea has finally solidified (thanks to the massively creative environment my employer Odeo provides) and taken a novel form. We're calling it twttr (though this original rendering calls it stat.us; I love the word.ed domains, e.g. gu.st/). It's evolved a lot in the past few months. From an excited discussion and persuasion on the South Park playground to a recently approved application for a SMS shortcode. I'm happy this idea has taken root; I hope it thrives.